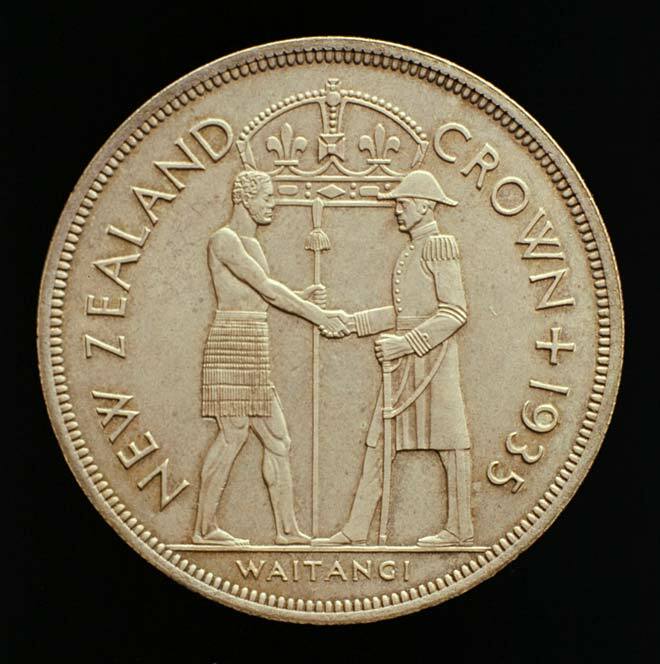 The Waitangi Crown, which was issued in 1935, is not strictly a commemorative coin, but the circumstances of its issue means it functions like one. It was struck after the New Zealand Numismatic Society approached the government to suggest a new coin marking the signing of the Treaty of Waitangi, New Zealand's founding document, in 1840. The coin was designed by New Zealand artist James Berry and adapted by British artist Percy Metcalfe. It shows Ngāpuhi chief Tāmati Waka Nene and the first governor of New Zealand, William Hobson, shaking hands above the legend 'Waitangi'. Because the issue was limited (1,128 coins were struck) and the government charged more for each coin than their face value, they were purchased as souvenirs and did not circulate. In the 2000s they sold for thousands of dollars.